While in the past one would think that it is a mistake of architecture, nowadays exposed structural elements of a home grant a natural and compelling contrast to any interior space. With the advent of industrial style, beams have became a fashionable living room decor. Check out this article and show, “bones“ of the home off with style! Each living area has unique appeal as a result of the exposed beams, although it has to be matched with own style of interior. However, thanks to its own variety, there are plenty ways how to use beams. Charm of this open living room is in high contrast between dark hardwood flooring and white walls and ceiling. The vaulted ceiling is crossed with white exposed beams for a truly unified look. This unique living room was for sure designed to brings the feeling of holiday. Amazing arched glass doors lining the whole back of the room providing a stunning view. However, the ceiling with asymmetric part of wooden beams is what makes it so unique. This Spanish colonial living room is great example of how can you create classy living room by using wooden beams. The black roof beams are unique decorative element on the ceiling of this contemporary living room. This industrial living room in loft style in New York is just unforgetable. Brick walls, steel construction with lights and special exposed beams makes this space perfect for evening meetings with friends. Living room dressed into grey color doesn’t have to be boring. With help of interesting decoartions as this huge floor lamp and exposed grey beams it can change to cool and chic interior. 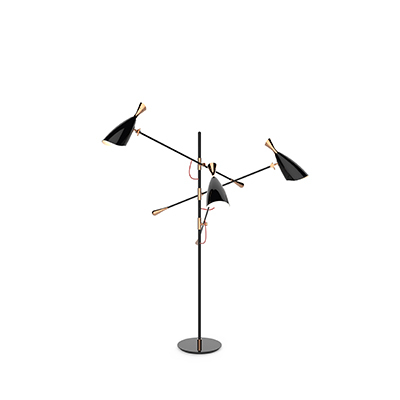 Meet Diana floor lamp is exactly what changes ordinary interiors to unique spaces. The tallest floor lamp of Heritage collection is an industrial floor lamp with a mid-century modern design, perfect for big industrial lofts and artistic studios. Built out of steel with a nickel plated finish in many colors will turn any room into a giant colorful inviting space.